I’m excited—this is my first interview. Here’s the news from Maj. Brian Dennis. In addition to being back in Iraq, he’s co-written a book on Nubs entitled Nubs: The True Story of a Mutt, a Marine, and a Miracle. It’s targeted towards kids, but I bet any dog lover will be interested in this remarkable story. (Note: I’m not connected to the book in any way.) 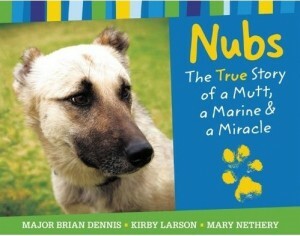 You can see more about Nubs’ story in this previous post. Who is Nubs staying with while you’re in Iraq? Nubs is staying with some great friends back in San Diego while I am deployed to Iraq again. He has two buddies he lives with, Bogey and Kublai. Bogey is my dog too, a pound rescue I picked up 10 years ago. How has he adapted to a more comfortable life? Nubs is doing well but is still adjusting to life in a home. He went from life as a wild pack dog in the Iraqi desert to a house in San Diego. Does Nubs have any separation anxiety? Or was he unflappable after life in Iraq? After I left for deployment again, he started acting up a bit. The problems were primarily with him acting very bossy at the house. He would sometimes growl at people who came over and even snapped at a couple people. These problems never occurred outside the house. 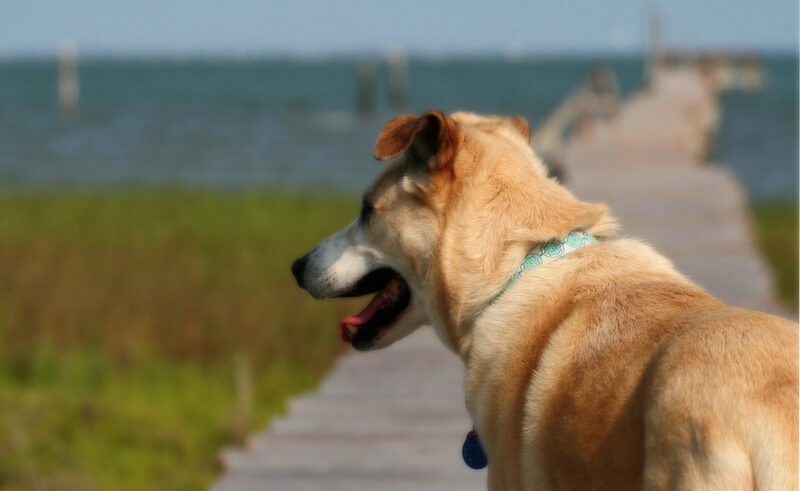 He would run free at dog parks and have all kinds of fun… not issues. He has always been a bit territorial at the house but with me gone, he has stepped it up a bit. I think he misses me and is frustrated that I’m not there. Sometimes I’ll make a Skype call (video conference with webcam) with my friends who are watching him. They hold him up to the screen and I say hi to him and talk to him. I’m not sure he understands what is going on when we do that… poor little guy. He hears me and see’s my face on a screen but I don’t know what is going through his head. I’d also be interested in any new observations about the issue of troops with pets. It continued to come up after your experience and I can understand both sides of the issue. I get that there are safety concerns, but it also seems there’s great value in the comfort, morale, and entertainment animals can provide given the stress and seeming monotony y’all face. I’ve also seen comments that dogs can actually provide safety. People who aren’t there can speculate all day. I’m interested in what you think. There are countless stories of Marines, soldiers, and sailors connecting with dogs out here; I’ve even heard some stories about cats as well. Mindset can be strange out here. There are a lot of times when you are tremendously bored. Then there are times when you are tremendously busy. A lot of people see some bad stuff out here. Some have described combat as countless hours of boredom punctuated by moments of abject terror. People connect with animals out here for the same reasons we connect to them back home. Animal lovers love animals. And in bad situations animals (a dog in my case) can offer solace and a glimpse of home. He might do something funny to make you smile after a nasty fire-fight or if someone in your team just got hurt by an IED. This wasn’t the case with my team… we were lucky and all made it out of Iraq unscathed on our last tour. I can’t explain why, but he always just made us smile, lifted our spirits. And it makes me smile as I write this to know he is probably at the beach right now chasing Bogey and Kublai around. What do you think of the state of dogs and cats in Iraq during this deployment? Worse, better, same? As far as the life of dogs throughout the rest of Iraq goes, it is the same as it is in most developing countries. There are wild dogs who live much like coyotes do around the world. They hunt, they forage, and they fight for territory. That is what life was like for Nubs and his pack here. The dogs who live in the cities have it a bit rougher. The dogs continue to breed and their overpopulation is a problem. Do you see any signs of outside help for animal welfare? Groups like World Society for Animal Welfare provide veterinary care for areas of disaster and strife. I honestly don’t know if there is any type of organization like the ASPCA out here; I’d be shocked to find out there was. Have you seen different attitudes towards dogs from different Iraqis? I know there is dog fighting. And that some Muslims believe dogs are “unclean”. But, I’ve wondered about farmers and people who have livestock who use dogs to guard and herd. I imagine that there are/were residents in towns who have/had dogs as pets or as guard dogs. Do you see different attitudes? In much of the Arab culture dogs are looked down upon. Not many people keep them as pets and they are often considered a nuisance. The Bedouin who tend sheep in the desert are a bit different. They utilize dogs to help tend and keep their sheep. They are kind to them and treat them as companions. All in all though, dogs in Iraq have difficult lives compared to their American counterparts. Do you think you might bring another dog home? I’m definitely not looking to take another dog home. I wouldn’t have taken Nubs home if he hadn’t tracked me down. 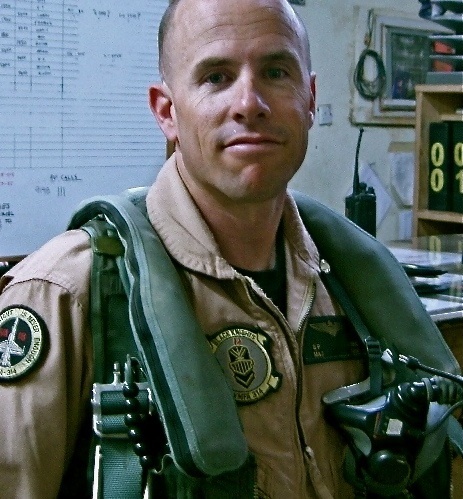 Although I really connected with him, I viewed him as a pack animal and admired his life in the wild Iraqi desert. He had been abused by humans and one of them cut his ears off. I don’t know why he would ever want to associate with humans again; but for whatever reason, he really bonded with my team in Iraq and essentially chose to be a part of a new pack. Can you say generally where you are and what you’re doing? And do you know when you’re going home? 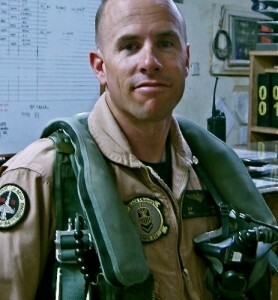 I am currently deployed to Iraq again in my normal job as an F/A-18 Hornet pilot. The last time I was out here I was leading an 11 man team training the Iraqis and conducting counter-insurgency operations along the Syrian and Jordanian borders. Previous to that I did another tour out here flying F/A-18s from an aircraft carrier in the Arabian Gulf. I’ll return to San Diego in late September. If anyone wants to contact me or has questions about Nubs, they are free to contact me. A friend of a dog is a friend of mine. 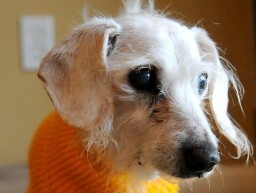 Chanel was a wirehaired dachshund who lived to be 21 years old in New York State. And not through clean living. Chanel ate sticks of butter and chocolate, which is toxic to dogs. 21 is 147 in “dog years”. Pretty amazing. Buddy sounds like some overgrown bumblebee. Perfect for Spring! Eegads, how cute is this?! And inexpensive! 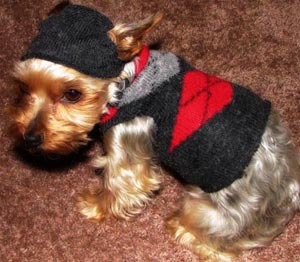 Follow this quick & easy tutorial and you’ll have a sock sweater for your little dog in no time.